It's hard to explain, but I can tell early on if I'm going to like a mystery. Sometimes I've been led astray, but most often not. There's something about an author's voice that can pull me in or out. You might call me a lazy reader, because I don't particularly care for thinking too hard when I read. I know many readers enjoy mental exercises, and take delight in keeping track of intricate plots. That's okay for them, but I don't want to expend that kind of effort. Reading to me is entertainment, not work. That doesn't mean I want an author to spell out every little detail or plot twist that might happen, so I don't have to figure any of it out. I prefer a certain amount of clues sprinkled in, but not too many. I also enjoy splashes of humor, but I'll read a mystery without that. To me, characterization is more important than anything in a book. I love to get into the hero or heroine's head, and think and feel like that person. Pretending to be someone else, seeing things through that person's eyes, and sharing emotions, that's why I read. Everything else is secondary. What about you? Maybe you prefer brain exercises instead. The lake was mostly frozen. It was mid-December, and my long-time hunting partner, Larry, and I were duck and goose hunting at a reclaimed mine area in southwestern Indiana. The temperature hovered below freezing and the wind was whipping around us. After our arrival, we flushed out about 200 to 300 ducks, mostly Mallards, Ringnecks, plus a few geese, We placed a group of goose decoys in a harvested bean field behind us. We stood in Indian grass in the northeast corner of the field, across from a small island near the south area of the lake where the north, south, and east fingers of the lake meet. There were about two acres of open, shallow water near that small island. My partner knocked down one goose which fell about twenty-five yards in front of me and about 10 yards east of the island. It landed on ice. 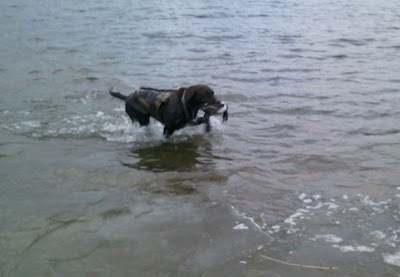 I sent my five-year-old, female, 60-pound, Chocolate Lab, Ryder, to retrieve the goose. As she took off running, the goose ran to the island, then onto a mud flat before heading into the water on the west side of the island. Ryder stayed right with her retrieved the bird and brought it to me. Soon after this, my hunting partner, Larry, shot another goose which fell dead into the bean field. Then, Larry knocked down a Hen Mallard into the field. It got up and flew southeast. Ryder headed back to the field, and I assumed she was going to run down the mallard. While Ryder was in the field, Larry shot another Mallard, this time a Drake, which looked as if it would fall a few yards off shore, but it actually landed 30-35 yards out on the ice. Ryder saw it fall, and before I could call her off, she was running full speed ahead, out onto the ice. She retrieved the bird and started back. She had advanced about 10 feet before she fell through the ice. We immediately began shouting for her to leave the bird and come back, but she stubbornly kept that duck in her mouth and fought to get out of the icy hole. We continued to shout for a few minutes and realized she was in real trouble, but would not give up the bird. Since we had no poles or flotation devices with us, I decided to return to my truck, which was parked 200 yards to the east. I drove the truck back to a spot closest to the water and removed a canvas bag of decoys for floatation assistance, an extension pole and proceeded to ease my way across the ice. I made it about 15 to 20 yards and fell through the ice. I was able to keep my upper body well above the water by holding on to the decoy bag. The ice was about one and a half inches thick. Ryder continued to tread water with her legs. She kept trying to exit the hole, but repeatedly slipped back into the water. All the while, she would not release the bird. We called a friend who lives within a few minutes of the lake and asked him to bring a small boat and ropes. We continued shouting for Ryder to leave the bird and come, but she would not release it, and she could not make out of the icy waters. This lasted for 15 to 20 minutes. Then, all of a sudden, for whatever reason, divine intervention, luck, and a very strong, determined dog, she finally made it out of that icy hole and began walking very quickly toward me. It was even almost a run. She wasn’t worn out by a long shot. I was walking toward her. She still had the bird in her mouth. A few steps later Ryder fell in the hole where I had earlier fallen. I was able to reach her with the decoys, remove the bird from her mouth and assist her out of the hole. She immediately picked up the bird and proceeded to the shore, where she appeared to be a little cold, but otherwise seemed fine. After a big shake, getting water everywhere, she went to the truck with me. I removed her Avery Vest and placed her in the warm, waiting truck. My back was wet. The inside of my waders were wet from when I fell and crawled out of the icy hole I'd fallen into, but otherwise, we were very thankful we had a safe dog. We estimated Ryder had been in frigid water for about twenty minutes. I am not sure, but I feel that might have been my last hunt for a long time if I'd lost her. I am sure I probably could not have gone home, as Ryder is also an important member of the family and my wife’s child since the children are all out on their own. Needless to say, we have a strict rule now: no birds will be shot unless we are very sure they will fall on land or in open water. The next afternoon, Ryder was back at work and retrieved two geese that fell in the water. 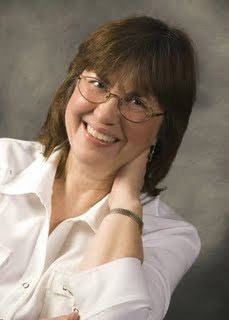 I feel the fact that she was wearing her Avery Vest was very helpful in keeping her afloat and preserving her energy. 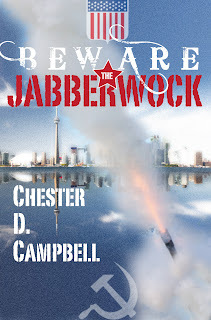 My newest ebook, just available on Amazon for the Kindle, is titled Beware the Jabberwock. It has quite a story behind it. Actually, several stories. I wrote it back in 1990 after I retired from an eighteen-year career as executive vice president of a statewide trade association. I had written non-fiction for years as a newspaper reporter, free-lance writer, magazine editor, and a few other permutations. I had written two book manuscripts over the years and told everyone I intended to write novels when I retired. I was an avid spy story reader all through the Cold War, so it was natural that I turned to this genre when I looked for a plot. I had read extensively about the KGB and CIA and had no trouble creating a situation involving both agencies. With the Iron Curtain shredding and the Soviet Union falling apart, clandestine warriors on both sides found their futures in jeopardy. I chose that as my starting point. Since this was an international thriller, the setting was anywhere. I had been on a fifteen-day tour of Europe in the early eighties and spent a month touring the Far East in 1987. With that background, I had lots of possibilities to choose from. I started the story in Vienna, then moved to Washington, DC.guide I had to depend on guidebooks for scenes on Cyprus and in Tel Aviv, but I had visited Hong Kong and most of the locations in the States. I created a small island off the Florida coast south of Apalachicola. 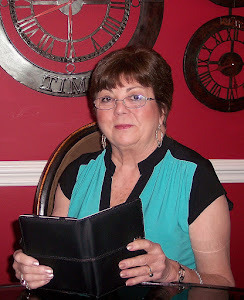 For the main character, I turned to a man I had met back in the sixties when I was editor of Nashville Magazine. He was a close friend of one of my colleagues and I got to know him pretty well. He was an ex-FBI agent with a wild story to tell. I did a long interview with him, and we talked about writing a book. Then he had second thoughts about writing it as a true story. The statute of limitations hadn't run out on some of the things he had done. According to his story, and my colleague vouched for his authenticity, he had gone to Washington out of high school and worked as a clerk at FBI Headquarters while getting an accounting degree. His job involved taking documents to Hoover's home, and he became closely associated with the director. He attended the FBI Academy after graduation and worked as a field agent. He was tapped by Hoover to be a member of his Goon Squad, a select group of agents who carried out sometimes illegal acts for the director. According to my guy, some of it involved cases outside the U.S.
Hoover and his assistant came up with a plan to infiltrate the Mafia and chose my agent for the task. He was told to resign from the FBI, commit a few crimes to establish his bona fides, and work to get in with the mob in Las Vegas. But after months of trying, he never managed to get connected. When he came back to Washington, Hoover refused to talk to him, calling him a failure. All of this is covered in the background of my character, Burke Hill. I lost contact with the ex-agent but learned he died several years ago. It makes for quite a story. You can check out Beware the Jabberwock at http://www.amazon.com/dp/B007VQJ3PY. I have concluded that social media, especially Twitter and Facebook are colossal wastes of time. I know that is heresy among writers struggling to find readers, but has anybody actually bought a book because they read a tweet? Has anybody's tweet sold a book? Tweeting is like walking through a madhouse where everybody is saying something but nobody is conversing. Right now I'm following 70 people but I have no idea where they're going. About the same number are following me. To where? For what? "However the Muse May Strike--OR Beware the Headwriting Author." I don't know what that means. Do you? "My Giant-Size Man-Thing, a birthday gift from (email address redacted)" I too have a monster in my pants, but tweeting about it is creepy. "Robot prostitutes. No, not the Page 3 celebs at Bombay Times parties." (Followed by a link to the Huffington Post.) Is this about journalism or marital aids? "I haven't teased you with any spidey stuff yet. So here you go." I don't want to know what this means. Arachnophobes stay away. "Game of Thrones. Instagrammed." Does anybody speak English? "Rangers win all games in a series in Boston for first time since 1997. Winning streak at 6. Rangers 6, Boston 3." Finally, something I can understand. But is it worth scrolling through the other stuff to get to? It's nothing but an ESPN crawl, which I seldom read anyway. "The smaller the squirrel, the bigger the nut." I can't wait to drop this gem into my next department meeting. Here are some things that are more productive than tweeting. 1. Playing Computer Solitaire. Recent research finds that a game of solitaire can reduce stress. 2. Watching a game between the Twins and the Yankees. The Twins might be the worst team in baseball and the Yankees are ready for medicare. Plus, they are in the American League where pitchers don't bat. But it's baseball. 3. Spraying for bagworms on my evergreens. It's gotta be done. 4. Ukulele lessons. Nothing like plunking an uke to put a smile on your face. 5. Learning how to mix an Amaretto sour. Need I say more? 7. Discussing said novel with your wife or close friend who lived through the cold war. 8. Finishing your own cold war novel. How satisfying is that? 9. Revising that short story you've been trying to sell. 10. Walk outside and get to know your neighborhood. I could be all wrong about social networking. If I am. let me know. I'd really like to know how many tweets you read, on average, to find one book worth buying and, on the other side, how many tweets you write to sell one book. This particular book is full of spirits and ghosts and a bit of devil worshiping. Spirits and ghosts I know a lot about, devil worshiping, not so much and have had to do some research. Of course there's murder and a haunted house. When I saw that they are reviving Dark Shadows I was thrilled. My kids used to rush home from school to watch each episode of Dark Shadows with me. Yes, it was cheesy, the acting was way overblown, the sets thrown together, but oh, it was so much fun. I've watched the trailer for the movie and I can hardly wait. Johnny Depp will be a great Barnaby Collins. What does this have to do with the book I'm writing? 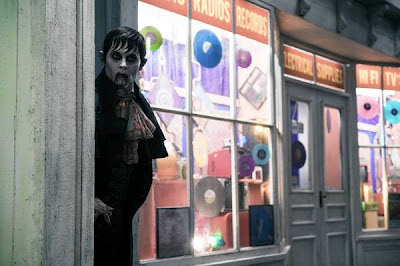 I hope I can put some of the same atmosphere into the book that the old Dark Shadows TV movie exuded. Corny or not, it was spooky. It's a mystery to me where all the time goes. It's got to be around here somewhere, but where? I'm now retired, but not really, since I spend a lot of time online marketing and writing, usually in that order. Most of the important stuff seems to happen online in the morning, and if I wait until later, I know I'll miss something. Today, I promised myself I'd get through my emails, support other authors where needed, do my blog, and then hurry over to my work in progress. Well, I'm just now doing the blog. Also, the last part of my list never happened. I made the mistake of bringing something down to the basement, and realizing I had tons of work to do there. So, I spent my afternoon cleaning the basement. Six bags of garbage, some recycling items, some giveaways, and I finally called it quits for today. Last week was the same thing. I made the mistake of going downstairs and many bags of garbage and recycling later, I still wasn't through. Wait a minute. I just solved the mystery. I know where the time went. It went into the basement. 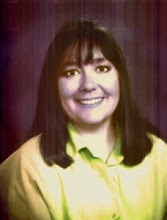 Diary of Murder can be downloaded today on Kindle at tinyurl.com/79vflvg. 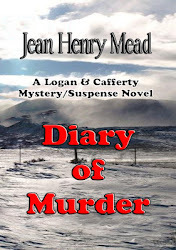 It's the second novel in my Logan & Cafferty mystery/suspense series and features two baby boomer women amateur sleuths who are traveling in Colorado in their motorhome when Dana Logan receives a call from her brother-in-law telling her that her sister Georgi has committed suicide. Dana knows her sister would never take her own life and, with her friend Sarah Cafferty, drives through a Rocky Mountain blizzard to Wyoming to prove it was murder. They find a diary written by Dana's sister and place their own lives in danger by investigating Georgi's death. Along the way they discover more bodies as well as a vicious drug ring. Humor, light romance, mystery and suspense. Ever notice how, when you are in a relationship with someone, you tend to speak in shortcuts that the other person knows but maybe someone else won’t understand? I’ll give you a couple of examples from my own life. When my children were very little, when they wanted to know why I did something, I would answer “only, ‘cause.” My children would then parrot back at me, “Because you love me?” and of course, the answer was yes. As they got older, they stopped adding the second part. But still, “only ‘cause” was one way I could still tell them during their teen years what I felt without embarrassing them. My husband and I also tend toward verbal short cuts. He might tell me how irritated he got driving because he had both a regulator and bumblebees to contend with. A regulator is our word for someone who rushes to pull his car out in front of you, and then drives at least 20 miles under the speed limit. He wasn’t referring to the insect either in this conversation, when he talked about bumblebees. He meant bikers, who tend to dress for whatever reason in black and yellow and who can get pretty testy with drivers sometimes. The reason I’m writing on this today, is that I just finished a book where the main characters were supposed to be very close. They did a lot of hugging, a lot of hand holding and yet, I missed those little, telling, verbal shortcuts. Give your characters a real relationship, with no backstory. Have them use language that lets your reader know they have a shared past. I know it will enrich the story. I'm happy to present Caroline Clemmons as my guest today. 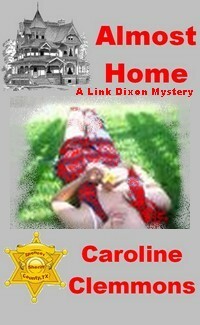 Caroline is an excellent writer of Mystery novels but writes in as many genres as anyone I know. 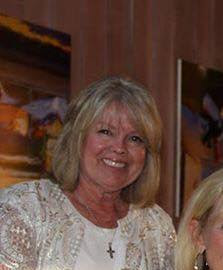 She's also published in Contemporary Romance, Western Historical Romance and Adventure, Time Travel, Romantic Suspense and more. All her work stands out for smooth and cohesive storylines, but she also shines especially bright in development of characters. Here she tells some of her secrets. Hello, Caroline Clemmons here. Characterization is one of my favorite topics. I sometimes teach characterization as a class. Are you set for a few days for me to tell you my theories? LOL Don’t worry, I promise to keep this short today. For every writer, there’s a theory on character development. When I started writing, I had no idea how to go about shaping my hero, heroine, and secondary characters. I love eccentric or whimsical secondary characters with qualities simply not tolerated in the hero or heroine. But, how could I prevent comedic, eccentric, or whimsical secondary character from overpowering the hero/heroine? When did I change point of view (POV)? How could I make my characters memorable? My first clues came after I joined a writers group. Their workshops were eye-openers. Presentations on character arc, point of view, hero’s journey, and many more topics left me wondering if I would ever grasp even half of what I was hearing. A program on mind mapping as a way to plot made me want to run screaming from the room. My first major break arrived in the form of Laura Baker and Robin Perini and their “Story Magic” all-day workshop. 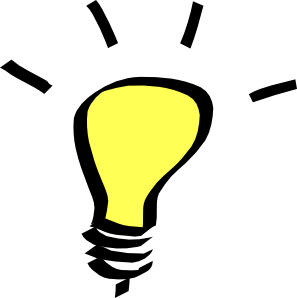 Imagine a light bulb going on over my head just like in a cartoon! And I mean a search light sized glow. If you haven’t attended this workshop do yourself a favor and sign up. “Story Magic” is well named, and worked like a fairy sprinkling her fairy dust on my computer. Since “Story Magic,” I have worked on creating my own character development style. I've lectured on and taught workshops on characterization, and will teach another one later this year. Here's the class in a nutshell. The secret to developing deep POV and memorable characters, in my opinion, is what I call “Method POV.” Just as actors learn to become the character they portray, authors must become the character in whose POV the scene is written. This is lik e the secret handshake of character development and now you’re a member of the secret society. Record ONLY those sensory details the POV character experiences or knows! A good side benefit of this is that you won’t head-hop. Mom shakes her finger at son. "You'd better be home by ten tonight." As parents, how many times have we seen the eye roll? Can we count that high? Keeping secondary characters in their place is hard. Authors can’t let them overshadow the hero or heroine. They’re supposed to be like sidekicks: Tonto to the Lone Ranger, Ethel Mertz to Lu cy Ricardo. Yes, they’re important to show character development for the hero and heroine and to reveal backstory, but they can’t steal the show. We whip them into line and remind them they’re helpers not leaders. When we plan one of our secondary characters as the hero or heroine in the next book, we don’t let them do anything dishonorable or they won’t be worthy of their own book later. We usually introduce them initially in a way they can star in the next book. A good illustration of this Julie Garwood'sBuchanan series and Jayne Ann Krentz's Arcane series. I hope readers enjoy the secondary characters in my books and fall in love with the main characters. My western historical romance, THE TEXAN’S IRISH BRIDE, features a supporting cast of both comic and villainous secondary characters. In my modern paranormal time travel romantic suspense, OUT OF THE BLUE, I hope readers love the hero’s mom as much as I do. SAVE YOUR HEART FOR ME is a western historical adventure romance. HOME, SWEET TEXAS HOME is unusual for me in that it has only a tiny bit of larceny but no murder, no kidnapping, just romance. These four are available from online sources and www.thewildrosepress.com/caroline-clemmons-m-638.html. The four books above plus two historical romance novellas, HAPPY IS THE BRIDE and LONG WAY HOME, and my mystery, ALMOST HOME, are at Amazon Kindle, also for only 99 cents. What a bargain! 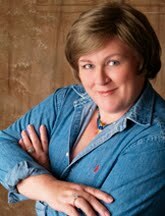 Please check http://carolineclemmons.blogspot.com for interesting (in my opinion) articles, giveaways, interviews, book reviews, guest authors, and new releases. Keep reading books (and our blogs), please. Thanks to Earl for having me as his guest today. It's three o'clock in the morning and a strange sound awakens you. The tinkle of falling glass, the scrape of a chair across a terrazzo floor, maybe the clink of silver pieces dropped into a bag. 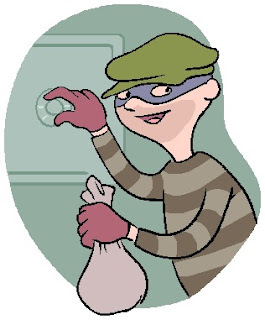 Home invasions are on the rise, no doubt due to the economy and the rising drug trade, the number of addicts in need of fix money. And the number of home owners buying a weapon to defend themselves are on the rise. But when faced with a home invasion, what do you do? You need to think about this, because it could happen to you. Indeed, it happened to me some years ago. I'm not going to write about what home defense weapons are the best, for now. I'll save that for Part II, to be run at a later date. Instead, I'll talk about defensive considerations. And you should think about them. Indeed, you should have a plan. One home defense expert has said that in a true home invasion, you may have as little as eight seconds to react. If that's the case, you may or may not have time to reach for the phone to call 911. And you should try to do so, unless it's obvious that reaching for the phone will get you dead. But let's say you're awakened and you're not sure what you heard. Lie still and listen. Your cat may just have knocked something over. But if it's a burglary, you will likely hear further movement which will confirm your worst fear. Then you reach for the phone. Same thing for your home alarm going off. It may just be the wind. Stay still for a moment and listen. If a break-in is confirmed, dial 911 before your alarm company calls you back. Massad Ayoob, noted author, cop, founder of Lethal Force Institute, Inc., the Massad Ayoob Group, a training academy for police and civilians both and an expert witness for both prosecution and defense, suggests the next thing you should do after dialing 911, is put some clothes on. You will feel much more self-assured with clothes, even a bathrobe, than stark naked. If you have a weapon, don't put it under the bed. Bugs, dust bunnies, anything that can move into your gun barrel, can cause a catastrophic failure. Don't put a gun under a pillow. You may have a dream and shoot your spouse or yourself. Same thing with a night table. Instead, keep the gun in a handgun safe that can be opened with no light, either by touch or feel. You don't want to be looking around for a key in the dark. Which brings up another recommendation by Ayoob: Keep the lights off. If you're silent and in the dark, an intruder may not realize someone's there. Your eyes will adjust, if they're not already. Yes, making noise may scare an intruder away, but if he's high on drugs or has a harm agenda, noise will tell him where you are. You know your residence better than an intruder does; make use of this information. Whisper to your spouse to be silent and either get on the floor on far side of the bed or walk quietly into the closet, especially if the closet door has a lock. The mattress will provide some protection, and if the intruder doesn't kill you both right away, he'll probably put you in the closet anyway. The intruder will be in a hurry. If he can't find you, he can't shoot you. And the last thing you need is a spouse yelling, hampering your thoughts or giving away your location. Your focus needs to be on protection, not diluted by worrying about where your spouse is or what he or she is doing. You do not want him or her peering over your shoulder. Assuming you have a weapon and want to ward off the intruder, consider whether you can shoot the intruder. Many states have a Castle Rule. Under the Castle Rule, for a successful prosecution against you, the prosecution must prove beyond a reasonable doubt that you had no imminent fear of deadly force. But some states, like Wisconsin, have reversed this rule. You, the shooter, must prove beyond a reasonable doubt that you feared imminent deadly peril and that you had no other less deadly means of defending yourself -- a very difficult standard to overcome, especially when it's dark and you don't know if your intruder is armed or not. Shooting someone for stealing your stuff will send you to jail in these Castle-reverse states. Do you fire a warning shot? If you do, you tell the intruder exactly where you are. Indeed, he may even see your muzzle flash and aim directly for that. Again, most intruders interested only in burglary will flee. But how do you know this intruder's agenda or the condition of his mind? Depending upon what you've learned from listening to the intruder and considering where you are and what your state law provides, make your decision as to warning shot or not. Time is on your side. The longer your intruder is in your home, the greater risk he runs. Do what you can to buy time. If you called 911, help is on the way. But let's say your phone lines have been cut or for some reason you didn't call 911. Should your weapon be equipped with a light or laser? I like lasers and don't like lights. I'll tell you why. A laser is harder for a bad guy to spot than a light. And a red dot on someone's chest usually gets their attention; it tells them you have a bead on them. But it also tells him where that bead is coming from. Still, the laser dot is harder to spot than a bright flashlight, so you may have several seconds advantage with the laser, plus you'll have your target down pat. Plus, a laser doesn't destroy your night vision. A flashlight or strobe does. I don't like flashlights attached to guns. While you're searching with the light for where the bad guy is, he knows exactly where you are, and he will probably find you before you find him. Bang, you're dead. If you're going to use a flashlight, hold it over your head and to the side and put it on strobe, so the bad guy's aim may be thrown off. You'll see this tactic on some Sportsmen's Channel personal defense shows. You don't need an expensive weapon. If you do shoot, count on being fully investigated with a good probability of being prosecuted. You'll never see that gun again, or if you do, it won't be in good shape. Cops don't take care of custodial guns; indeed, they often ruin them. Don't brag to your buddies about how well prepared you are to defend yourself. Don't show off your guns. Don't tamper with the factory trigger or use handloads. These tidbits can and will be used by a prosecutor to show intent to kill or maim. Yes, you were invaded, but you are the defendant, in both a criminal case and the sure-to-follow civil suit. And since you intended to fire, your insurance policy probably won't cover you for damages -- maybe not the costs of your civil case either. If you and your spouse have followed these suggestions and have done what you can to protect yourselves, not having fired a shot, the standard for self-defense may be higher than if you have others in the house, like children, who also need protection. You're entitled to protect them too, so a prosecutor weighing all the facts will accept more aggressive actions on your part in these circumstances. Bottom line: You have to make these decisions, and they aren't easy ones. They'll have to be made quickly. You'll have to take what you see and hear and make snap decisions. The more time passes, the harder your decision, especially because assuming you called 911, help is on the way. The prosecution and civil risk rises with the passage of time. And that's why you need a plan. Is it April already? Yikes. Seems like only yesterday I was adjusting the hands on my clocks for Daylight Savings Time. Of course, it was only a couple of days ago I remembered to change the batteries in my smoke detectors—something I should have done with the time change. However, my point is that time seems to be zipping by, and at my age, that's not good. In fact, it's zipping so fast I'm sure I won't be ready when HOT ROCKS is released in the Fall. But, fortunately, Midnight Ink is more organized than I. The publicity department has set up a conference call for April 20. I can just picture how that's going to go. They will have a concrete plan for me and ask for my input. I'll sit there with the phone in my ear and go, "Uh, uh . . ."
Since there are many successful authors who follow this blog and write on this blog, I'd sure appreciate some advice on what I should do to prepare myself for the conference call and for the book release. Postcards? Bookmarks? Press releases? Yes, I've had other books published, some seven of them, but this time, I feel like I need to work harder, be more prepared, be . . . Can't put a word on it, but whatever it is, I don't want to come off as a rank amateur—though I might well fit the definition. So, if you ever had the desire to tell Randy where to get off—or get on—this is your opportunity to do it. Don't be bashful, Sylvia Dickey Smith and Earl Staggs do it all the time. I'm sure all readers of this blog know by now that our own Earl Staggs won the 2012 Derringer Award for Best Novelette given by the Short Mystery Fiction Society. Earl's story is Where Billy Died. I hope he will check in here to the comments section and tell everyone how to purchase the story, or else give us that information in his blog post. I am happy to say I read it, enjoyed and voted for it. The Derringers have been recognizing the best in short mysteries since 1998. I try to read every finalist each year because some of the best cutting edge crime stories can be found there. They have also been a source of inspiration for me. Just knowing there is an award for short mystery stories drives me to make my stories the best I can. Speaking of inspiration, I just finished Breathing Water, a Poke Rafferty novel by Tim Hallinan. At the back of the novel he lists the music he listened to while writing it. I'd never given thought about how much the music I listen to influences my writing. When I'm at my computer, I either have NPR on the radio or a selection of music on my iTunes. If I'm doing chores such as paying bills or taxes, then NPR gives a welcome relief, but if I'm writing, NPR is a distraction and I turn to the music. So what's on my playlist? It depends on whether I'm writing or revising. If I'm writing, I like to work with an eclectic mix of blues, rock, and classical. This morning I listened to Stevie Ray Vaughan, Jeff Beck, Joanna Connor, Santana, The Allman Brothers, The Grateful Dead, Led Zeppelin, The Traveling Wilburys, Jimmy Reed, Lisa Lim, John Fogarty, and the Beatles. For reasons I can't explain, complicated guitar pieces get my writing mojo going. I don't pay much attention to the lyrics, except for Grateful Dead songs, which I stop and listen to, just for the turn of phrase. Whenever I hear "Operator" by The Dead, I find myself in the mind of a character who is "Riding a getaway bus out of Portland, talkin' to the night." I think someday I will write a whole story about that. If not blues and rock, then I'm listening to classical. I find any symphony by Beethoven a great aid to writing, except for the ninth. I can't do anything else but listen while the ninth is playing. Other classical pieces that help my writing are Korsakov's Scheherazade, Prokofiev's Lt. Kije Suite, and Stravinsky's Fire Bird. I don't know why those pieces resonate with me. They just do. You might ask, why not Hawaiian music? I listen to Hawaiian music, also Irish music, and Jimmy Buffett, but not when I'm writing. I put that music on when I'm doing the things that aren't fun, such as checking grammar and spelling. Or else they come on when the writing's done and I have a gin and tonic in hand. Do you listen to music while you write? What gets your mojo working? Maybe Earl will let us in on what gets his mojo working. Whatever it is, I might try it. Check out Game Face, my collection of short stories on iPad, Nook, Kindle and other devices. Oh, My Goodness, What Have I Done? 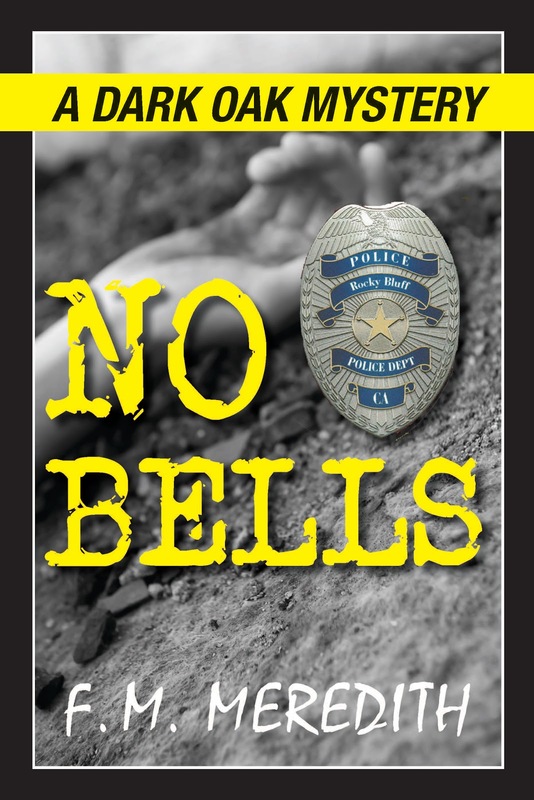 My latest book in the Rocky Bluff P.D. 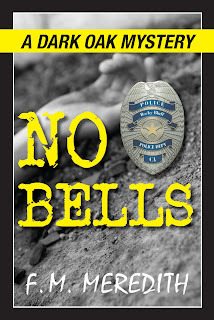 series, No Bells, is now available. In fact, my own copies arrived today. I'll be sending out review copies to those who would like to review it. In the middle of that tour, I'll be doing another with other authors. I also have several personal appearances. I'm starting a new quarterly newsletter and need to get interested parties signed up. 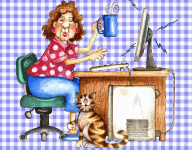 If you are one who'd like to know what I'm up to on a regular basis, send me an email at mmeredith@ocsnet.net and put Marilyn's Newsletter in the Subject line. Because I'm a regular person I've got other things I need to do, like plan and shop for the family's Easter Sunday Dinner. And, I got my final 1099 so I can finish my income tax. Need I say more? Oh, and I just returned from Left Coast Crime in Sacramento and you know what that means when it comes to catching up on the mail and the laundry. Hope to see some of you while I'm touring. Officer Gordon Butler has found the woman of his dreams, there's only one big problem, she's the main suspect in a murder case. You'd have to be hiding under a rock not to know anything about the Trayvon Martin case. I don't want to get into opinions about guilt or innocence, since that's not for me to decide. I'm just bringing this up because of the furor over a simple article of clothing called a hoodie. In some circles, if you wear one, that indicates deviousness. Incidentally, I wear them all the time, but my only claim to deviousness is trying to mislead readers until the end of the book when all is revealed. When writing fiction, be it a mystery or other genre, you can use clothes stereotyping to advantage by including a general or specific description of what characters are wearing. Particularly, in the historical romance genre, detailed descriptions are provided for readers to ground them in the era and the person's station in life. In mysteries, it's not necessary to go into minute detail, but it wouldn't hurt to occasionally throw in the types of clothes the characters are wearing. Such details can hint at what type of character you're portraying. A fastidious person might wear a pressed suit or outfit including a vest or cardigan, while a free spirit might wear jeans or Dockers. Also, keep in mind where your characters live and what season it is, because that will make a difference. An Arizona person might normally wear shorts outside in March, but if someone in Minnesota did, it would seem odd. What people wear also can depend on age or physical characteristics. Younger, thinner people can get away with revealing clothes. In Forever Young: Blessing or Curse, the main character is 55 years old, with post-middle aged spread and is embarrassed when asked to don a bikini for the "before" photos. Later, when she turns 24, the prospect of wearing one isn't as repulsive to her. Bad guys or gals are often portrayed as sloppy dressers, with dirty or torn clothes, and inattention to their overall appearance.You could use that stereotype to describe a bad guy, but it might be even more fun to go the other way. Make that person seem normal on the outside, but that's a mask hiding true evilness, such as in the case of Ted Bundy. Also, if you provide clothing descriptions, later on when police come up with evidence, such as fabric threads at crime scenes, it can all tie in. From what I've mentioned, you can get a general idea of ways to include clothes in stories. Maybe you can think of other examples. Diesel, Smashwords, Sony, in Print, also in the UK. Happy April Fool's Day! It's been a long time since anyone's used this day to pull a fast one on me, not that they couldn't still do it with ease. Just whisper in my ear that Hollywood wants to turn my mysteries into movies, and watch my knees turn to jelly. Maybe the first-of-April jokes are a thing of the past, and we can focus on more serious things like marketing our mysteries. And maybe some of what I've learned can be fuel for your own marketing efforts. What works, and what doesn't? Let's get it right on the table that I still have more ignorance than knowledge, but the scales are slowly tilting in the right direction. In the last week or so, author Jeff Rivera sent around an email to a lot of people he apparently didn't know. If you go to the Amazon site for his book Effortless Marketing, you'll see that a number of people received an email from someone named "Mogoli Angelberg." Now doesn't that have to be a real name? I mean, who would ever make up a name like that? Anyway, the email flattered the recipient and touted Rivera's book. As a result, Rivera ticked off a bunch of people. As of this morning, his e-book has 26 five-star reviews on Amazon and 13 one-star reviews. That's awful! It would break my heart to see so many people thinking so little of me and my work. I read the book, and it's okay. Not great, but okay. My biggest criticism is the title, because there is no such thing as effortless marketing. So Rivera, who is most likely a very nice man, provides us with an object lesson: be honest, and don't get in people's faces. Sending out a flood of emails to strangers is bad enough without pretending you know them and admire their work. What does work? Well, work. In my experience so far, Twitter has been helpful. Starting when I had about 1700 followers I tweeted about my books, and others retweeted--that is, they passed my messages along to their followers. To encourage people to do this, I made a special point of doing the same for them. More of my tweets are about other people than about my own work. On the positive side, I made good money for a couple of months. On the negative side, there were diminishing returns. But I would encourage you to try using Twitter. Of course results will vary, but there is a nice market for low-priced ebooks, and Twitter is a good place to begin tapping into it. So to come back to my bad pun, this is my April fuel that can kindle (and fire up) your e-book marketing. Just please, please don't pay anyone for a marketing campaign.